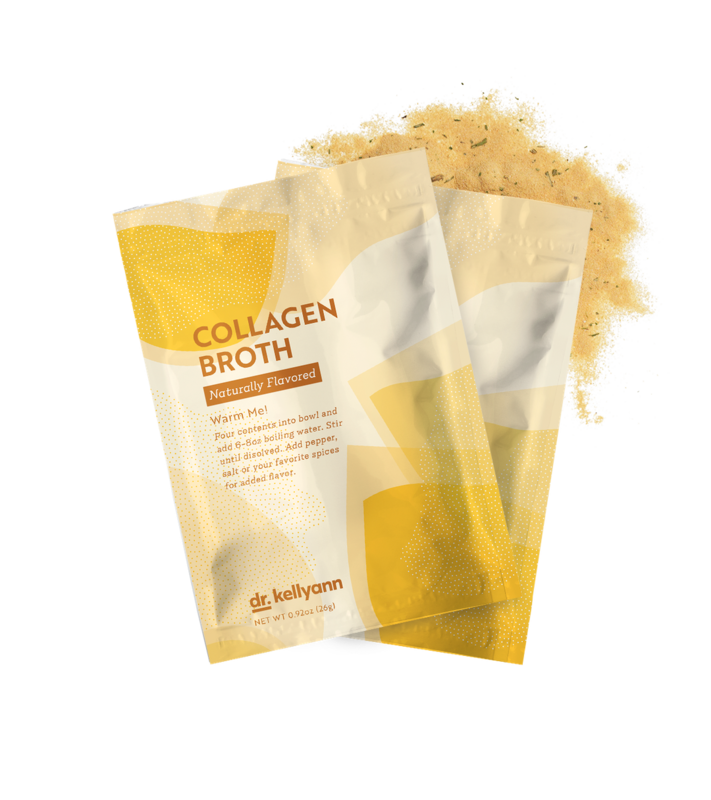 Collagen is what gives your skin its elasticity and supports muscles, joints, tendons, and ligaments. From the age of 20 on, you lose about one percent of your collagen each year. This leads to wrinkling, sagging, cellulite, and achy joints. 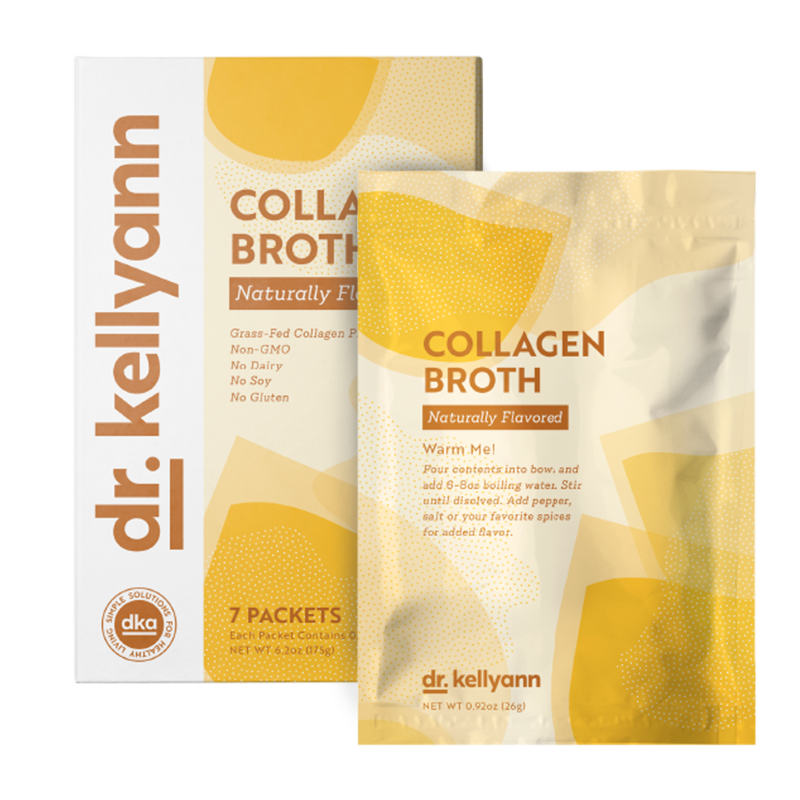 To prevent this relentless aging, you need to increase your collagen levels, and one of the easiest, and most delicious ways to get more collagen is with bone broth. Bone broth is loaded with the building blocks of collagen and mainlines these building blocks directly to your cells. The result: Your skin gets smooth and dewy, and your joint health improves. 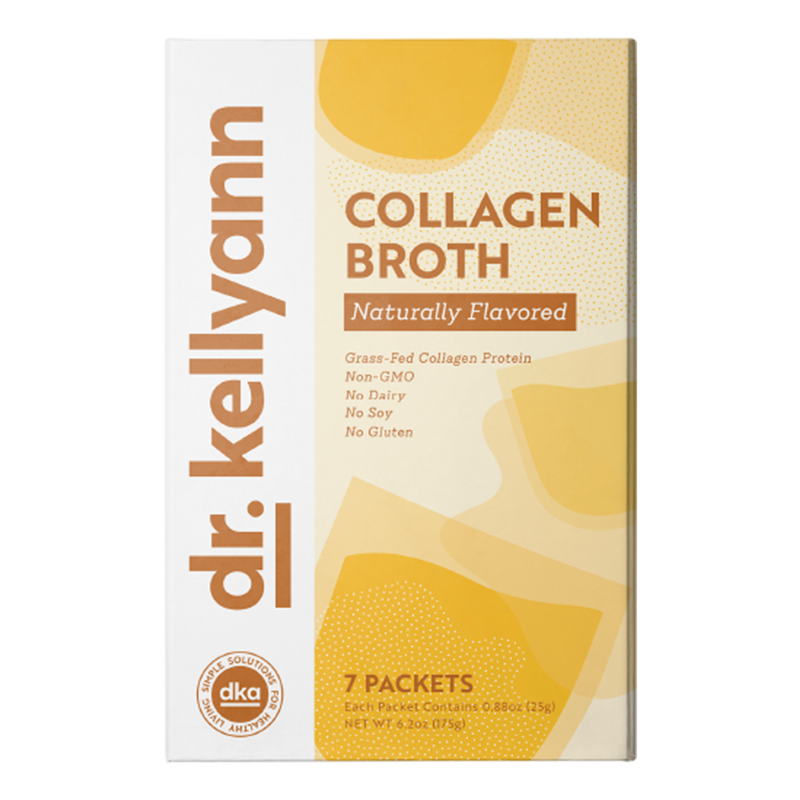 Dr. Kellyann’s Collagen Broth makes getting a daily does of collagen and bone broth simple, easy, and delicious with to-go packets--just add hot water. Packed with collagen. Collagen helps your body burn fat and form lean muscle mass, shaping your arms, legs, and core. Beautifies your skin. Bone broth is loaded with the building blocks of collagen, the structural protein that makes your skin strong and smooth. Bone broth is also rich in hyaluronic acid, which erases wrinkles and takes years off your face. Detoxifies your body. The amino acids glycine and proline aid your liver in removing toxins from your body. In addition, glycine is a building block of glutathione, one of the body’s most powerful detoxifying agents. Heals your gut. Helps your digestive system by battling problems like —constipation, diarrhea, and gas. The gelatin and other nutrients in bone broth help to heal the gut, curing digestive problems and facilitate weight loss. Aids digestion. Bone broth is hydrophilic—it attracts and holds liquids like digestive juices, helping you digest food more efficiently. Fast weight loss. These days, we know that weight gain and many age-related diseases start with chronic inflammation. When you heal that inflammation with nutrients like those concentrated in bone broth—including anti-inflammatory proline, glycine, and arginine—your weight starts to fall off. Heals your joints. Bone broth gives you a generous supply of glucosamine, chondroitin, and other glycosaminoglycans (GAGs) that help heal your joints. GAGs also help your body lay down needed collagen. In addition, hyaluronic acid helps to lubricate your joints, keeping them healthy and pain-free. Helps relieve anxiety and help you sleep better. The glycine in bone broth can lower anxiety by countering the effects of norepinephrine. In addition, bone broth is an excellent source of magnesium, which has powerful calming effects. Fills you up without adding pounds. Bone broth and bone-broth soups are rich, complex, hearty, and soul-satisfying. Bone broth comes loaded with amino acids and minerals like magnesium and phosphorus, as well as healthy fatty acids and iron from the bone marrow, it feeds your body deep nutrition that keeps hunger at bay for hours. It’s nearly carb-free, and has only a few calories. Mini-fast by shortening your eating window each day. For example, my 10-Day Belly Slimdown has you eat within a 7-hour window each day (noon to 7 pm). Other popular mini-fasting windows are 16:8 and 20:4, which means you fast for 16, or 20, hours and eat your daily meals during an 8-hour, or 4-hour, window. Mini-fasts for 24 hours 2 days a week. During these 24-hour mini fasts, often called a 5:2 diet, you restrict your daily caloric intake to 500 calories. In my Bone Broth Diet, I recommend doing two mini-fasts a week where you sip on bone broth throughout the day. Get all the flavor and health benefits of bone broth in a convenient, easy-to-use packet. Simply add to hot water and you’re ready to go!